Who is it for? 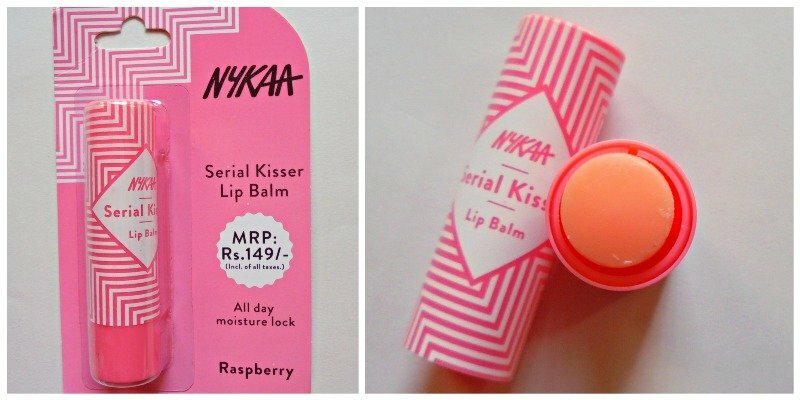 Nykaa Serial Kisser Lip Balm Raspberry is a fruity flavored lip balm with a transparent and moisturizing formula. It is a good lip balm that will suit everyone. This lip balm comes in a lipstick like a base-twist bullet. The color selection of the packaging is very attractive. The bullet is colored in pastel coral as it is associated with raspberry flavored balm. The packaging is very sturdy and completely travel-safe. The attractive pattern of the lip balm’s lid will rub off easily if it is exposed to the friction of the other products in your purse. This is a colorless lip balm. It gives a translucent finish to my lips. The texture of this lip balm is moisturizing but non-greasy. But its formula is comparable to Maybelline’s Baby Lips balms. It gives a nice shine to the lips. The staying power of this lip balm is about 4 hours in my case without counting drinks or meal. It has a nice raspberry fragrance. The fragrance is very similar to raspberry jelly candies. I am in love with the light and yummy smell. I love the rich syrupy flavor of raspberry and this lip balm has that kind of fragrance. I must give Nykaa a high five for this. This vegan lip balm has a very nourishing formula. Still, consistency is not sticky. I have used this as an overnight lip balm for soft lips. I apply it in a thick layer and the next day I wake up with plump looking lips. It heals chaps and makes the dead cells of my lips soft. I often use this one immediately after applying my homemade sugar lip scrub. I love the moisturizing formula and fragrance. So, I might buy this variant again. I would recommend it to all those ladies who are looking for a moisturizing lip balm with a transparent finish.